South Africa's HIV epidemic has levelled off at an infection rate of 10.9% for those aged two or older, according to a new study. The survey also suggests the rate of infection in children and teenagers could be falling. This could be partly attributed to increased use of condoms, it says. But the survey warned that the overall situation remained "dire". 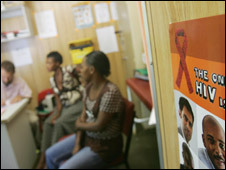 South Africa has the world's largest HIV-positive population, at 5.5 million. Women aged between 20 and 34 continued to be the worst affected, with 33% carrying HIV, the report by the Human Sciences Research Council said. Olive Shisana, an author of the study of 20,826 people released on Tuesday, said there were "promising findings of a changing pattern of HIV infection among children and youth". "The good news is that the change in HIV prevalence in children is most likely attributable to the successful implementation of several HIV-prevention interventions," she said. In children aged 2-14, HIV prevalence had dropped from 5.6% in 2002 to 2.5% in 2008, the report said. There was also a fall in new infections among teenagers aged 15-19. The overall level of HIV infection in those aged two and over, at 10.9%, had moved little. In 2002 the figure was 10.8% and in 2005 11.4%. Reports of condom use were sharply up among young people. In 2002 57% of men aged 15-24 said they used a condom at their last sexual encounter - a figure which rose to 87% in 2008. The figure for women in the same age group rose from 46% to 73%. "There is clearly light at the end of the tunnel," said Health Minister Aaron Motsoaledi. "There is real light." However, the survey also listed a series of challenges, including a rise in the number of those who have many sexual partners and an increase in HIV prevalence among 15-49 year-olds in some provinces. Fraser McNeill, an anthropologist at the London School of Economics who has studied HIV/Aids among South Africa's Venda ethnic group, told the BBC's Focus on Africa programme that the report was "great news" if the statistics were reliable. But he cautioned that programmes to tackle HIV could run up against cultural obstacles. "I found ways in which Aids intervention programmes are implemented are counterproductive," he said. "People on the ground often believe that condoms actually cause Aids, and the women who are involved in the process of Aids education are often framed as vectors of the virus."